One of the biggest milestone events in X-Men history is almost here! 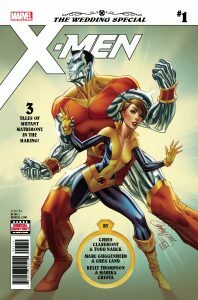 Kitty Pryde and Colossus are finally about the tie the knot…but what’s a wedding without the respective bachelor and bachelorette parties? Join Marc Guggenheim and Kelly Thompson for two parties that can only be celebrated Marvel style! All this, plus, a Kitty and Colossus story by legendary X-Men scribe, Chris Claremont!! !